When the English music historian Dr. Charles Burney travelled through Bohemia in 1772, he was struck by the widespread poverty, but also by the enthusiasm with which music was fostered: ‘I found out…that, not only in every large town, but in all villages, where there is a reading and writing school, children of both sexes are taught music.’ Indeed, during the 18th century, the Czech lands had been exporting distinguished musicians to many parts of Europe – opportunities at home were severely limited, as Bohemia and Moravia declined to mere provinces of the Austrian Empire and aristocratic patrons spent most of their time in the Imperial capital, Vienna. Fifty years later, at the time of Smetana’s birth (in Litomyšl, east of Prague, near the traditional border between Bohemia and Moravia), little had changed, except for the emergence of a growing movement to promote the Czech language and culture. In 1856, Smetana, too, decided to try and improve his fortunes by moving to the Swedish city of Göteborg, where he was immediately in demand as a pianist, conductor and teacher. But a strong interest in the political situation in his native country and a desire to play his part in its cultural revival led him, after less than five years, to return to Prague. It was while he was in Sweden that Smetana began to work out the style, imbued with characteristics of Czech folk music and prosody which he would employ for the rest of his life and that clearly influenced Dvořák to take a similar path. The Piano Trio, however, written in the autumn of 1855, is without any pronounced national character, though formed from a single point of inspiration. Its composition followed immediately after the death, from scarlet fever, of Smetana’s five-year-old eldest daughter, Bedřiška; his account states that her loss “caused” the Trio, and it shows his remarkable ability to turn deep personal feeling into powerful musical ideas and forms. In three movements, the work lacks the customary Adagio or Andante; instead, the opening Moderato assai has the gravity expected of a slow movement, as well as the elaborate thematic development typical of a post-Beethoven first movement. Based on a rhetorical, chromatically-descending theme, announced at the outset by the violin alone, the movement is clearly an expression of intense sorrow, while a second theme, announced by the cello in a major key, is of a more consoling character. But the phrases of this melody all tend downwards and its initial, hopeful whole-tone upward step changes to a minor interval. Smetana was a virtuoso pianist and we can hear echoes of those contemporary composers he most admired: Schumann, Liszt (who became a lifelong friend and was a keen admirer of this trio) and especially Chopin. He surely inspired a remarkable passage at the close of the agitated development section, where the piano is given a meditative, free solo – like a cadenza – with expressive ornamental flourishes. Significantly – and strikingly – however, it is the anguished, stormy music that returns, with an increase in tempo, to end the movement. The second movement is in the form of a scherzo with two trios (or “alternativos”, as Smetana calls them). He left no detailed programme for this work, as he did for the later Quartet From my Life, but we can imagine it as a portrait of his daughter, Bedřiška, or rather, a memory; the music remains in the minor key, with a wistful quality and the first movement’s “grief” motif is interwoven into the main melody. The first alternativo may perhaps be designed to show Bedřiška’s tender side; the second presents a sharper contrast, with its grand manner and pseudo-baroque dotted rhythms and sequences. It seems likely that this represents a recall to grim reality; its softer answering phrases are, again, derived from the first movement and marked “con dolore” (‘with pain’). The main theme of the finale, with its incessantly busy texture, looks forward to the music Smetana would often introduce in his operas for scenes of activity. Here, the constant conflict between divisions of the beat into two and three creates a feeling of agitation and unease. The second theme, by contrast, is lyrical, in the major key, yet it repeats the melodic intervals of the first. The mood here has softened from the first movement’s passionate sorrow to a gentler sadness and regret. After the second appearance of this tender melody, however, the music seems to lose its bearings. A series of modulations gradually descends, taking us back to G minor where the movement’s opening is transformed into a bleak funeral march. Finally, the major key returns for a brilliant conclusion, perhaps expressing a determination to rise above the tragedy, but the memory of the solemn march remains and, indeed, there’s a shadowy return to G minor immediately before the final bars. At its first performance, all the Prague critics disliked Smetana’s Trio, yet a year or two later it was received with enthusiasm by audiences in Sweden. Smetana returned to Prague in 1861 at a time of intense nationalistic activity. In 1862, the Provisional Theatre was established to promote drama and opera in Czech. The following year, Smetana won a competition for a patriotic opera – even though, at this period, his command of the Czech language was limited – with Braniboři v Čechách (‘The Brandenburgers in Bohemia’); and by 1866 he had become conductor at the Provisional Theatre. Playing viola in the orchestra there was the young composer, Antonín Dvořák, who thus had every opportunity to get to know his older compatriot and become familiar with his music. Smetana admired and encouraged Dvořák, conducting his Third Symphony in 1874 and, around this time, Dvořák’s style, following a period when Wagner had been his dominant influence, began to acquire the national inflexions that Smetana had adopted in works such as Prodaná nevěsta (‘The Bartered Bride’). After the onset of Smetana’s deafness in 1874, which ended his conducting career and made his financial situation increasingly precarious, one or two recorded remarks suggest he envied something of Dvořák’s international fame. But he continued to support the younger composer, suggesting him, for example, for commissions. Dvořák, for his part, had joined his colleagues at the Provisional Theatre in 1872 in publicly expressing support for Smetana when his position as conductor was under threat. The two composers had very different priorities, however; Smetana was inspired above all by the music, language and history of his homeland, while Dvořák had a wider interest in Slavonic culture (hence his Slavonic Dances, as opposed to Smetana’s Czech Dances). And whereas virtually all Smetana’s mature music has a poetic, extra-musical content that influences its form, Dvořák was more interested in continuing and revitalising classical forms. The Dumky Trio stands apart from his other chamber works, however, on account of its original and unusual form. Dumky, the plural of Dumka, is a Ukrainian word signifying a lament. Dvořák began to use the term in 1876; there are Dumky in his Sextet, Op. 48, the String Quartet, Op. 51, and the Piano Quintet, Op. 81. The main feature of the Dumka, as Dvořák understood it, is the alternation of slow, sad music with lively dance-like sections, and such contrasts appear in all six movements of the Dumky Trio. He thus abandons the conventional contrasts of tempo between movements, while also discarding the traditional tonal unity of classical instrumental forms; each movement has a different tonal centre. Yet the work is more than a set of independent short pieces; the sequence of keys is carefully planned, as is the change of mood from one movement to the next. Unlike Smetana, Dvořák was no virtuoso pianist, but he was a good enough keyboard player to take the piano part of this trio at its first performance, shortly after its completion, in April 1891, and on a tour of Bohemia and Moravia the following year, just prior to his departure for America. His piano writing does not show the same technical development as Smetana’s, but this leaves him free to treat his ensemble like a miniature orchestra, varying the scoring when a theme is repeated and creating a kaleidoscopic variety of textures. In the opening movement, with its simple ABAB form, the A section – a declamatory cello recitative accompanied by passionate piano figures – gives way to an expressive violin phrase, taken up by the cello with just the violin accompanying. This phrase, played by the cello in long notes, serves as a counterpoint to the lively, major-key B section, led by the piano. On the repeat of A, the scoring is completely reversed, with strings and piano changing places. For the second Dumka, the key steps down from E to C sharp minor, with haunting cello phrases that continually alternate between minor and major. The lively music stays firmly in the minor – a Polka with a drone bass. Another downward step takes us to A major for the third Dumka, an Andante with chordal phrases that alternate between piano and strings before giving way to simple melodic lines. The nostalgic final phrase is speeded up, turning to the minor for the vivace section. The fourth Dumka has a persistent two-part accompaniment figure, shared by piano and violin, under a melancholy cello melody. This melody always remains the cello’s property, tied to the plangent sonority of its alto register. There are two attempts to break free of this mood before, finally, a gradual increase of speed leads to a bright dance in the major. But it’s the cello melody that returns, to finish the movement. In the fifth Dumka, Dvořák doesn’t make radical tempo changes, but there are three contrasting elements, all involving a rising scale pattern: a declamatory, strongly emotional passage; an episode of semi-quaver passagework with the scale motif as an ostinato against it; and an energetic folk-style melody in the minor key, heard in canon, with violin and cello following one another. The final Dumka, in C minor, emphasises both the folk character of its dance music with obsessive repetition of a few notes and the Dumka’s origin as a lament, expressed through an extended violin melody. In the Dumky Trio, Dvořák succeeds in combining a folk-based style with profound exploration of the different emotional qualities associated with the elements of music – keys, modes, intervals and sonorities. Freed from the constraints of following classical forms, he presents these contrasting emotions with especial clarity. As a classic of the rock era, Queen's ‘Bohemian Rhapsody’ still delights music lovers today with its eclectic mix of styles ranging from slow ballad to opera to hard rock. At the time, it was a genre-bending piece which broke new ground and firmly cemented Freddie Mercury as a song writing powerhouse. 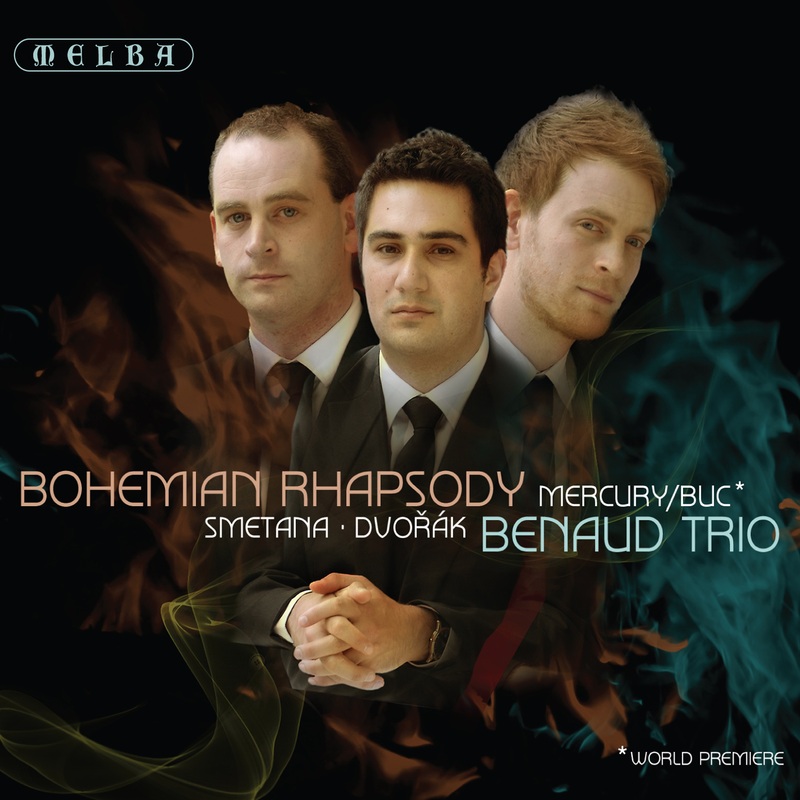 This arrangement for piano trio highlights the many classical influences in the piece, at times calling on the lyricism of Mercury's voice whilst contrasting it with the devilishly inventive "mock opera" outbursts that build to the climactic strains of 'that' famous guitar solo. ‘Bohemian Rhapsody’ has long been a favourite of classic rock enthusiasts, and it is hoped that this new arrangement serves as a nostalgic homage to Freddie Mercury and his "Queens" of rock. This project has been supported by the City of Port Phillip through the Cultural Development Fund.